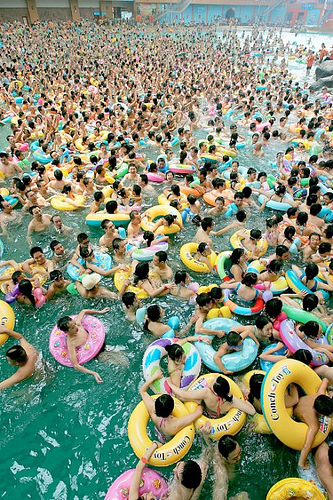 The heat wave that began in China has since spread throughout the region. Mother Nature is not going easy on Asia this summer. A few weeks ago word spread of China’s epic heat wave. People fried eggs and shrimp in skillets atop oven-hot manhole covers. A billboard spontaneously burst into flames, while glass cracked in Ningbo. Half-hatched chicks emerged from store-bought eggs while sitting at room temperature in Hunan. And the scorching weather persists – authorities have issued a level-two weather emergency across much of the country. On hearing the news, many outside China counted their blessings. While summer is by no means pleasant in East Asia, at least it wasn’t as hot as China. But now the rest of the region is getting its own taste. Japan and South Korea have joined China in experiencing what is by far the region’s hottest summer in decades. On Monday, the thermometer registered 41.0 degrees Celsius (105.8 degree Fahrenheit) in the town of Shimanto, Kochi prefecture, on Japan’s island of Shikoku. The Japan Times notes that not only was that a new national record high, but Shimanto was the first monitored spot in the archipelago to experience four continuous days with temperatures reaching 40 degrees. Last week at least 860 people in Tokyo were rushed to hospitals by ambulance and nationwide 17 died of heat-related complications. To compound matters, since wreaking havoc on the Philippines – killing two and displacing more than 100,000 – Typhoon Utor is now making a beeline for China’s Guangdong province, where it is expected to reach land tonight. Utor is being described as the world’s strongest typhoon so far this year, with winds reaching up to 175 per hour. Global warming has been listed as a major contributing factor to this climatic chaos, which is expected to become increasingly common in the years ahead. Just when it seemed like it couldn’t get any worse, worry over potential power outages in Japan and South Korea has entered the picture. In Japan, Tokyo Electric Power Co. used double the normal amount of coal in July to meet demand since the Fukushima Dai-Ichi nuclear plant is out of operation. And in South Korea the government has taken to shutting off the air-conditioning in public buildings to conserve power. “We are in a critical situation where, if any single power generator goes wrong, we will have to resort to rolling blackouts just like we did in 2011,” Yoon Sang Jick, South Korea’s minister of trade, industry and energy, said on Sunday. The heat wave now baking South Korea has already killed 10 people, with a national record high set in Gimhae (39.2 degrees Celsius). These cheap, wrinkle-free polyester slacks are being snatched from store shelves 50 percent faster than the same time last year. The price is right for the pants, which start around 5,000 won ($4.50) and go up to 40,000 won ($36) for a pair with a flashy geometric pattern. From Busan to Seoul, women can be seen strutting on sidewalks in the loose-fitting pants, which MSN has likened to those once donned by MC Hammer. With the heat expected to persist until Chuseok (Korean Thanksgiving) on September 19, functionality may triumph over fashion a little while longer. Record temperatures above 40 degrees C are sweeping China this summer.